When you go to a Stephen Sondheim show starring Broadway legends Bernadette Peters and Elaine Stritch, you know you’re in for a treat. I have recently decided that I need to see more Sondheim. I had the pleasure of hearing him speak earlier this year, and the life he’s lived and the things he’s experienced in the world of musical theater is amazing. His friend and mentor was Oscar Hammerstein of the great Rogers and Hammerstein, so he learned from the best, but he has a style all his own. 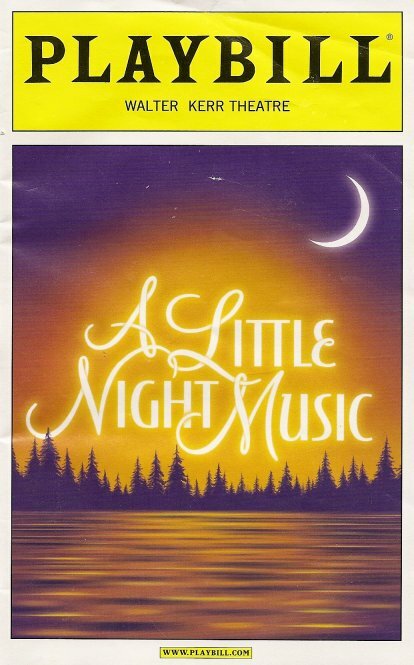 A Little Night Music is only the second Sondheim musical I’ve seen (not counting West Side Story and Gypsy, for which he wrote the lyrics), the other being Sweeney Todd. It was first produced in 1973, and the current revival opened late last year starring Angela Lansbury and Catherine Zeta-Jones. Although I would have loved to have seen the divine Ms. Lansbury, I’m quite happy with the replacement cast. I saw Bernadette in Gypsy a few years ago, and with the Minnesota Orchestra earlier this year. She’s amazing in everything she does (and is my hair role model ;). I must confess, I mostly know Elaine as Jack Donaghy’s mother on 30 Rock, but she’s also had an extensive career in the theater, so it was a privilege to see her on stage. I don’t believe she’s known for her singing voice, so she sort of spoke her solo song. But I found that interesting and moving, because you could really hear the lyrics, and she spoke them with such meaning and passion. 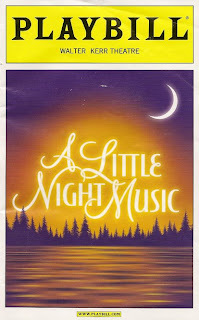 I didn’t know much about A Little Night Music before seeing the show. For some reason I thought it was a serious piece, maybe because the most famous song is the mournful “Send in the Clowns.” But it’s actually a light-hearted comedy for the most part. Based on the Ingmar Bergman film Smiles of a Summer Night, it’s set in Sweden in the early 20th century. Bernadette plays an actress named Desiree who travels a lot and has left her daughter Fredrika to be raised by her mother (Elaine). Desiree’s ex-lover Fredrik, who is Fredrika's father, is recently married to a beautiful, flighty young woman. They have yet to consummate their marriage, which may have something to do with the fact that she’s in love with her stepson! Fredrik surprises his wife with a night at the theater, where Desiree is performing. Fredrik later visits Desiree and they re-ignite their old flame, only to be interrupted by Desiree’s married lover! She decides to invite them all to a weekend in the country at her mother’s estate, where hijinks ensue, and everyone eventually ends up happily ever after. One of the features of the musical is a Greek chorus of five actors, who come out and sing commentary on the action and ease the transitions between scenes. The set is simple and elegant, and the period costumes grand. It’s a wonderful classic musical with beautiful, poignant, and funny lyrics, and an extremely talented cast. It was a lovely afternoon at the theater and an appropriate choice for my first New York City blog post!